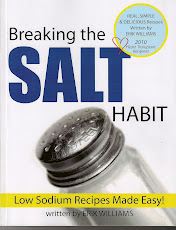 Thank you for visiting the new Breaking the Salt Habit Blog. My goal here is to help you eat a low sodium diet by offering lower sodium recipes, tips, and helping you find new lower sodium products. I was diagnosed with congestive heart failure in 2006 and was told I needed a heart transplant to continue living. Keeping my sodium intake below 2000mg was critical to making it to the transplant stage. I know how overwhelming it can be to start a new diet, especially a low sodium diet. With a lot of trial and error I started coming up with my own recipes, with easy to find ingredients, to help me accomplish this. Please let me know what you think of the recipes I have posted from my cookbook and new recipes I will introduce.